I saw a show a few years ago called “How William Shatner Changed the World” and it was in fact hosted by Canadian icon William Shatner of Star Trek fame. The premise was to look at all of the unimaginable science fiction utilized in the Star Trek series—that has since become reality. Some of the innovations looked at on the show include personal computers, tablet computers, iPods, automatic doors, and cell phones. You can now add the personal voice assistant that allows you to voice control home electronics to the list. 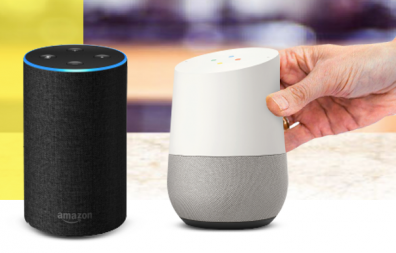 Led by such devices as Google’s Home Assistant and Amazon’s Alexa, voice assistants are constantly gaining the ability to help with an increasing number of tasks and projects. Helping to control your TV is yet another. I still remember having to get up and turn a rotary dial on the television set to access one of the eight or so channels available (that was after we got cable, I also remember having only two or three channels. I feel old now). Then came a remote control that may have originally been connected via a cable but eventually became wireless. Next in line was the universal remote that could control more than one device even though, to this day, I still have 5 or 6 remotes on my coffee table. Then the mobile device app came along to give us even more convenience and control over our media domain. Now, the voice assistant steps in and allows us to control our media devices with our voice. Thank you, Mr. Shatner. There are a couple of key requirements in order to take advantage of this technology. You will need a relatively new television set that lets you pair a Google or Alexa device to your TV. Sets that have this built-in capability will almost certainly promote that fact and allow you to control things like power, volume, and inputs. 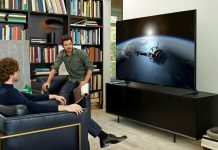 If you are in the market for a new TV, simply ask if the model you are looking at “works with Alexa” or is compatible with Google’s Home assistant. Certain brands are affiliated with each voice assistant although you can generally use with either. That is to say if something says it “works with Alexa” you can sometimes also use Google Home Assistant, at least to some degree, but always make sure first! 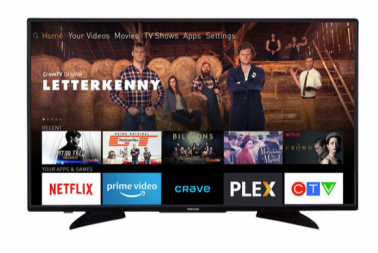 In the absence of this compatibility built-in to your television, you can connect a third party media streaming player like Roku or Chromecast that has voice control embedded in the device. This blog will take you through some of those choices. You can also add a Logitech Harmony Hub to your system and when paired with Alexa, gain comprehensive control of your TV capabilities although there is some fairly complicated setup required with this method. Alexa is the name given to Amazon’s voice assistant. The line of speakers she controls is called Echo. In addition to playing music from your Prime or Spotify account, Alexa can control smart tech in your home from lights to appliances to the thermostat. Alexa will make shopping lists (if you have a Prime membership, Alexa will actually shop and order for you) if you ask her to, give you the weather forecast, play a trivia game, or even tell you a terribly cheesy joke. She will also help you control your television. Alexa is available in a few different iterations. The entry level is the Echo Dot. 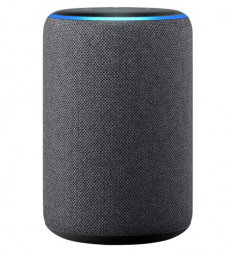 With a small built-in speaker, the Echo Dot works great as a voice controller but if you also want a quality speaker for music and such, then you want to look at the Echo or the Echo Plus. I have two Echo Dots at my place but since my home has a wired speaker system in each room with individual controls, I simply run an audio cable out from the Dot into one of the audio inputs on the wall by my TV. This then sends all audio out and through my home speaker system. 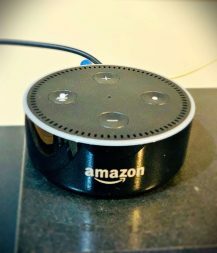 When I play music with Alexa I can access it in any room if I desire and when Alexa talks to me, it is broadcast through speakers in my ceilings rather than the confining small speaker on the Dot. If this, or a similar set-up, is not possible, then look to the larger Echo or Echo Plus. If I am watching my cable channels and want to swap over to another input, I just tell Alexa which input I want and, like some crazy awesome magic, there it is on my screen. At this time, I can’t use my voice to open or control my TV’s apps like Netlix or Prime, but I do expect that to be added in the future. 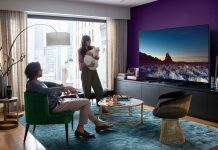 This may be Vizio specific and not a concern with other brands. Also, “works with Alexa” will likely still require you to download the Alexa app to a mobile device and then to pair your Echo to your TV. It can be confusing from here but the things Alexa can do are called “Skills” and are downloaded on the mobile app in order to work when you talk to Alexa. There are many great resources to guide you through this including this one. Same general rules apply as with the Alexa voice assistant units. For example, my Vizio can also be voice controlled with a Google Assistant Device. 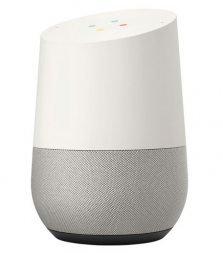 Google Home is the name of the branded smart speaker devices and Google Assistant is what they call their assistant. I agree, not exactly catchy or inventive. At the very least they could have called their assistant Doug to spice it up but, in the grand scheme that is neither here nor there. 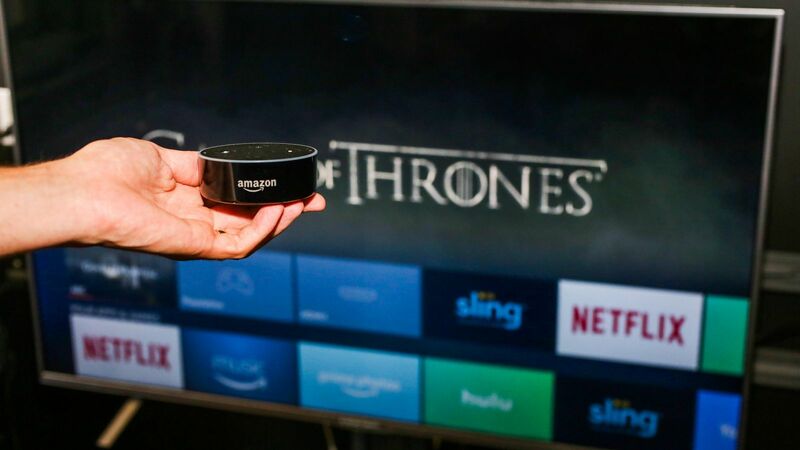 Voice control of your television set is now a thing but depends on which devices you are using or intend to use. If your TV set is FireTV friendly, FireTV is an Amazon product, then the Amazon Alexa units will work best for you. If you use ChromeCast or SmartCast (Google Products), then the Google Home Assistant is likely where you should turn. If you are simply planning on getting into the voice controlled world of Television watching then do your research and see which sets meet your needs and which method of voice control then best integrate with. Like most new technology, it can get confusing and complicated but fortunately for you, Best Buy Canada can provide you the answers you need so drop by your local store and ask away. My day job is as an Assistant Professor in Media and Communication Studies at the University of the Fraser Valley. My primary teaching and research interests revolve around popular culture and technology. I am an adequate at best guitar player currently attempting to romanticize my inglorious youth in a Hair Metal cover band called "Glam Chowder”. When not working or watching TV, I am usually listening to music, recording music, playing music, or trying to figure out what gear I need to make all of that music sound even better.